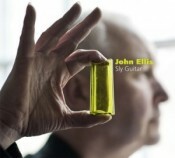 Many musicians in the electronic and ambient world found their way here via the avenue of rock ‘n roll, but few may have the punk pedigree of John Ellis. A founding member of the Vibrators and long-time guitarist for The Stranglers, Ellis brings that energy to his new collection of electronic-augmented guitar pieces, Sly Guitar. First off, this is just a blast to listen to. Ellis’ playing is sharp and fast, and his ear for a catchy tune hasn’t faded. Sly Guitar mixes studio pieces with exercises in live looping, and while the full-on pieces obviously pack more density and punch, the looped pieces are cool from a technical standpoint and also have the organic rawness of being live improvisations. Ellis comes at each differently. The first, “Infanta,” borders on the abstract. He opens with a riff packing a bit of Middle Eastern flair, which morphs into a long. wavering drone. He noodles over that, kicking out rapid-fire notes in cool contrast to the steadiness of the drone. Further down the disc, “Farud Gets Electricity” layers itself into something of a one-man garage-band jam as Ellis sneaks in each new phrase, then rocks out over his funky base. This is a straight-up rock tune crafted through looping, and catchy as hell. The title track is an 11-minute looping piece along the same lines as “Farud…” Although Ellis does do a bit of take out/put back in with his loops, the length of the piece makes the repetitive aspects of looping more apparent and can wear just a trifle thin. On the shorter pieces, one forgives a bit more. There are absolute gems among the rest of the tracks. The opener, “Levitation,” is a full-throttle pleasure cruise that’s all high energy and hooks. “I Remember Futurism” blends a repeating line that runs in concentric circles over sailing e-bow lines. (Ellis says there’s e-bow on most tracks, and he likes the way the instrument lets him “weird-up” his guitar sounds.) Tasty distortion here amps up the energy, and the production work is excellent (as it is across the board). “Don’t Be Misled By Your Eyes” brings in some world flavor with its percussion. The seductive pace of the beat lends mystery and smokiness as Ellis glides up and down his guitar neck. I catch a whiff of early Adrian Belew on this one. Vocal drops, which creep in on other tracks as well, round out the sound. Sly Guitar has made for a nice, upbeat and rocking respite from my otherwise steady diet of more ambient stuff. I keep coming back to it for general (ie, non-review) listening when I need a jolt of energy. It keeps paying off. Definitely give this one a go.